Now obviously we don’t think you’ll come across these beauties at your local Greggs. You’ve got to be looking for a specialist catering company or bakery. And gingerbread can be quite tricky to get right so you’ll want to find an expert. There is a famous Gingerbread company based in Grasmere (near Ambleside in the Lake District) and we once came across a brilliantly named company: ‘Ginger Bakers’ (after the drummer from 60’s band Cream). But as yet, we know of no company which dominates the Ginger market. 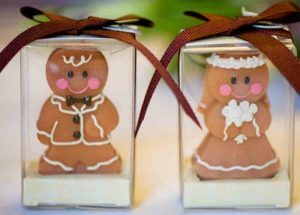 Every aspect to a wedding should be carefully considered and distinctive little treats like this always help to define a wedding. Helping to define a wedding as a special and unique occasion is also our aim when serving crepes at weddings. Obviously the choice of food for the evening or even the wedding breakfast is a fairly important choice, and crepes are an excellent way to take you wedding to another level, but even the smaller features such as Gingerbride Women (or Gingergroom Men if you prefer) can help lift your wedding from ordinary to extraordinary – if that is your aim, of course!